This is a shout out to 888 Washington Boulevard. Don’t get the wrong impression of this exciting and useful building just because a stabbing victim staggered in there two weeks ago. 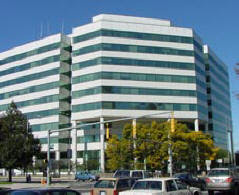 888 Wash, also known as the the Stamford Government Center, first came to my attention on a Friday afternoon. I was frantic to renew my expired license before driving to Boston, but I couldn't handle the idea of the traumatic Norwalk DMV. A friend tipped me off to a satellite DMV at 888 Wash. Satellite! The Stamford DMV is shabby but gets the job done. Although the main clerk may not be cheery, the woman who takes your picture can be charmed if you act like a neurotic freak who needs a perfect photo. When you ask, "Does it look good? Like, really good?" she'll say, "Nah, let's do it again." You're going to look hot, or at least attractive, for the next five years. 888 Wash doesn't stop there. Voter registration is right beside the DMV; sign up and stroll out. On the first floor, you can get your marriage license and buy a pass to Cove Island Beach. You can also pick up your recycling bins; the guy is kidding when he says each bin costs 20 bucks. The best part? 888’s convenient, free parking garage makes these errands quick and easy. Excitement factor? You have to sign in and show ID before taking the elevators upstairs. It feels top secret, and it’s reassuring to know we’re being watched. TIP: The DMV only takes cash or check, but there’s an ATM in the credit union down the hall. TIP 2: Check the satellite DMV's website before you go. It specifies what you can and can't do at the satellite office. To my own personal horror, you can't renew an expired registration. Another very convenient place to renew your license is the AAA office on 623 Newfield Ave. You just need your current driver's license and the renewal notice that you received in the mail. You need not be a AAA member to renew your driver's license there. When I went there last time, I got a pretty nice picture taken and I was the only one in line! Man- have I ever received a notice in the mail that my license was about to expire? I don't think I've lived in one place long enough for my address to stay current.